Immersing yourself in author and journalist Chris Hedges’ world, even briefly, is overwhelming and important. His work chronicles all that is ugly and corrupt in the corporate-controlled western world — from environmental destruction, to right-wing Christian fascism, to new-age slavery — and forces you to reconsider the spoon-fed notion that we live in a functioning democracy. His impeccable writing, his soaring calls to arms and his prickly personality are all hard earned as a Pulitzer Prize winning journalist, author and activist embroiled in the increasingly ugly fight for basic rights south of the border. Hedges sounds tired on the phone after spending the day in a Manhattan federal courtroom where Jeremy Hammond, an activist and hacker, was just sentenced to 10 years in prison for distributing emails from private intelligence firm Stratfor, which detailed, among other things, corporate and government collusion in spying on and attempting to persecute activists. 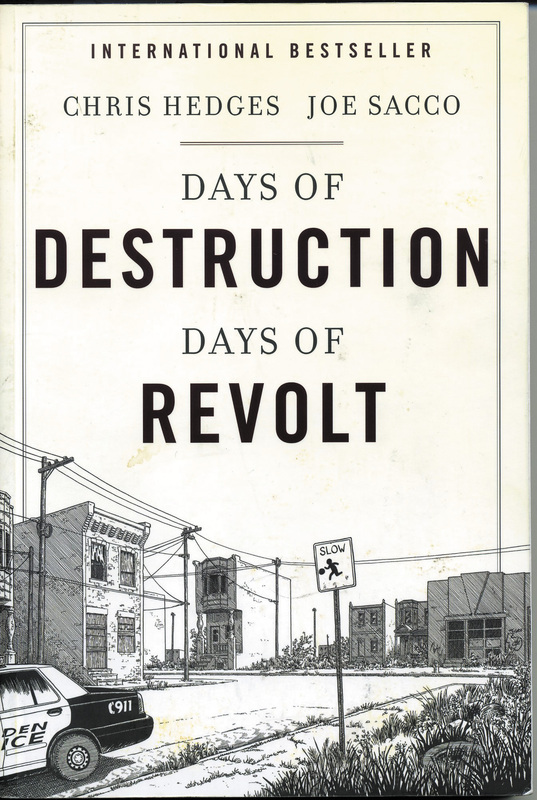 Hedges’ most recent book, Days of Destruction, Days of Revolt, a collaboration with illustrator Joe Sacco, is a shocking catalogue of misery in America’s “sacrifice zones” — areas essentially abandoned to corporate malfeasance and government neglect or corruption. It was an experience that took its toll. It sounds odd for a man who has worked in war zones and been stationed in shattered countries to describe writing a book on the wealthiest nation this world has ever seen in such stark terms, but reading through it, and delving into his collected work on Truthdig.com , paints a vivid picture of a declining superpower that has abandoned large swaths of the country as well as those mired in poverty. “Whether that’s in Bosnia or whether that’s in southern West Virginia, it’s painful to see, especially children, get discarded by forces that are callous to and indifferent to human suffering,” he says. It’s something that shouldn’t be seen as simply an American problem either. Although Canada is in better shape than our southern neighbours, income disparity is growing right along with the concentrations of wealth. The federal government is outright hostile to civil society groups while coddling and funding corporations, particularly those in the oil and gas sector. Those dismissive of his claims aren’t paying attention. Recent documents obtained by the independent Vancouver Observer show the National Energy Board, a federal agency tasked with regulating the energy sector, was collaborating with the very companies it is supposed to oversee in order to infiltrate and spy on anti-pipeline and anti-oilsands organizations, including Idle No More, Sierra Club and the Council of Canadians. It’s just one more indication of a state that is rapidly shedding what remains of its accountable veneer. But still, doesn’t Hedges give too much credit to those wealthy few pulling the (purse) strings? “We have created an oligarchic system where a fraction of one per cent controls staggering sums of wealth, and like all oligarchic states, with that kind of political and economic power, their primary concern is enriching and empowering themselves at everyone else’s expense,” he says. Which brings us to solutions, and they aren’t pretty. Hedges is convinced that the U.S. is headed for revolution. He reiterates the basic need to have information concerning the public in public hands, something that seems so shockingly simple it’s hard to imagine there are many who support prosecuting, or rather persecuting, those like Hammond who find and provide the information. Like the files obtained by the Vancouver Observer , only several times more terrifying, Hammond’s leak uncovered attempts to link non-violent activists with terrorist organizations in order to apply draconian terrorism “laws” — which includes indefinite detention with no charges — to them. “If [dissent] becomes a criminal act, and… if none of that [reaction] can be curbed or controlled or even known, and those who expose it are persecuted, then you inevitably create a system whereby dissent devolves into violence. That’s really what we’re flirting with,” says Hedges.